Get Your (Day) Party On At Tropicana This Saturday! 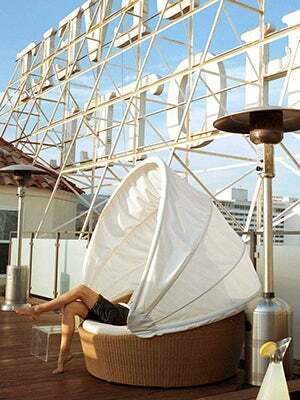 There’s nothing more quintessentially L.A. than a poppin’ pool party at the Roosevelt Hotel. Because really, when you mix hip peeps, dance beats, booze and of course, sunshine, how can you not have a blast? Local culture hub L.A. Canvas and sweet boutique Wasteland share the sentiment: They’re throwing a bash with all those aforementioned elements, aptly called The Dive Club, and it's being held at the hotel's famed Tropicana Bar this Saturday. The tunes of Mystery Skulls, Kittens, and DJ Keith 2.0 will be dominating the dance floor, and MINKPINK has a handle on the gift bags (score!). So, grab your fave suit and sunnies and kick off summer in a beyond rad way. Just don't forget to drink plenty of H20. When: Saturday, May 18, noon to 6 p.m.
Where: Tropicana Pool and Bar, 7000 Hollywood Boulevard (near North Orange Drive); 323-466-7000.